Founded in Ireland in 1952, Flair have built a trusted reputation as a specialist in the production of quality shower enclosures and bath screens. Under new ownership in 2015, Flair set out on a journey to reinvigorate this valued brand through innovation in design and craftsmanship. Flair collaborated with Design Partners to conceive and produce the ORO range of premium shower enclosures for European markets in 2017. The challenge was to create meaningful innovations to appeal to modern families and a unique design identity that would re-establish Flair as market leader in this category. 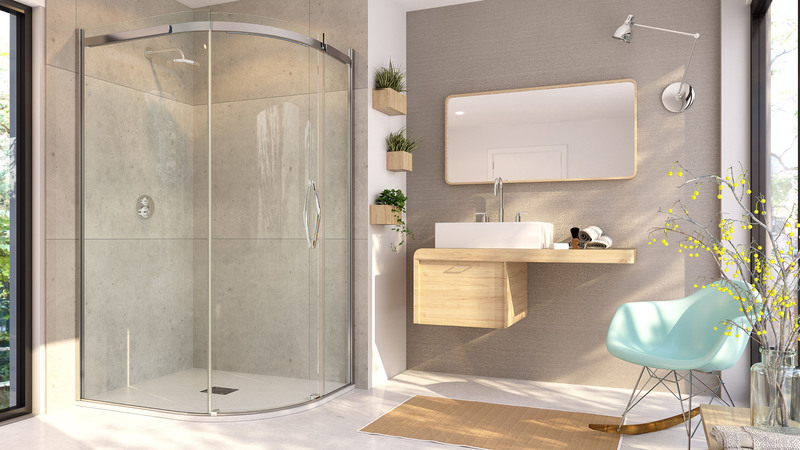 Also, to design with trade installers in mind by providing a flexible range of shower enclosures suitable for all bathroom layouts with build quality that would stand the test of time. Target customers are aged between 35-55 years and often have a young family. This means a busy life where the bathroom plays an important role to kick start the day or unwind before bed. A sanctuary for relaxation and a functional room that must withstand daily family usage. Also considering the requirements of trade installers, the flexibility they required in the range and ensuring the products could be installed easily and securely. We wanted the range to be loved and recommended by the trade as key influencers in the customer journey. As a key touchpoint on any shower enclosure, we created a premium door experience imbued with quality and luxury. The welcome point for the user. 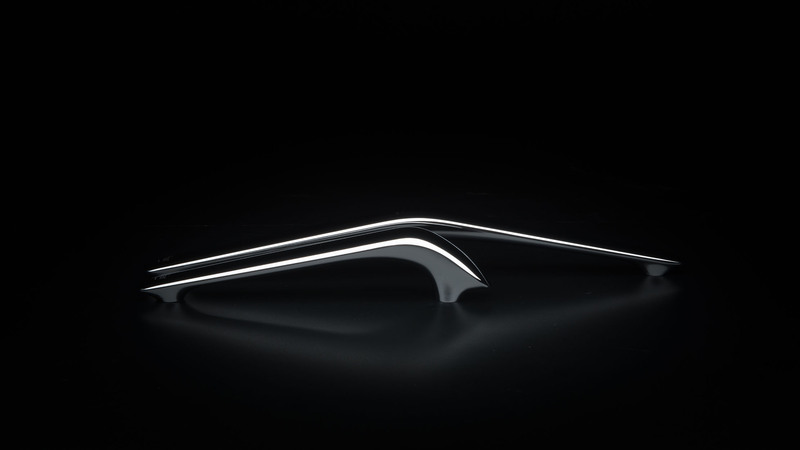 For ORO we’ve crafted a unique handle design that is sensual to touch yet extremely robust and solid. The elegant form was originally hand crafted to feel seductive in-hand. Then digitally remastered to control precise manufacturing in polished chrome. Our design process seamlessly bridges handcrafting with advanced digital design to deliver precision with a human touch. The sliding doors glide on patented magnetic guides and silent bearings to provide a smooth and effortless experience. An integrated dampener system cushions the door at the extent of opening and closing giving a refined stop. Every detail is carefully considered and engineered to optimise the user experience. Door hinges are flush mounted with countersink fasteners, so the user can easily clean the glass. 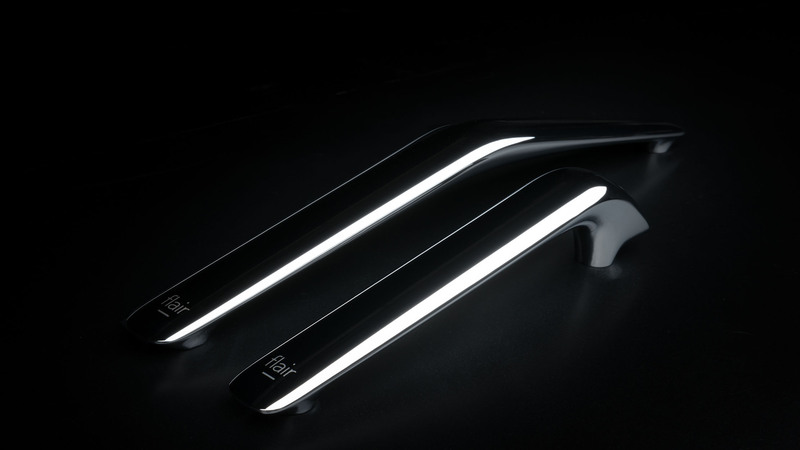 Ultra-clear door seals used throughout the range to prevent leakage without compromising the aesthetic. All mechanical details are cleverly concealed to reduce visual clutter. Each enclosure is constructed from 8mm toughened glass with hydrophobic coating to resist lime scale and grime build up. The 2 meter glass panels are secured with minimal yet robust aluminium wall extrusions, designed to recede and accentuate the tall glass structure. A full suite of mounting fixtures and elegant stabilising bars are included in the range to provide flexible and secure installation. Wall extrusions and stabilising bars can be easily adjusted at installation to allow for variations in wall construction.